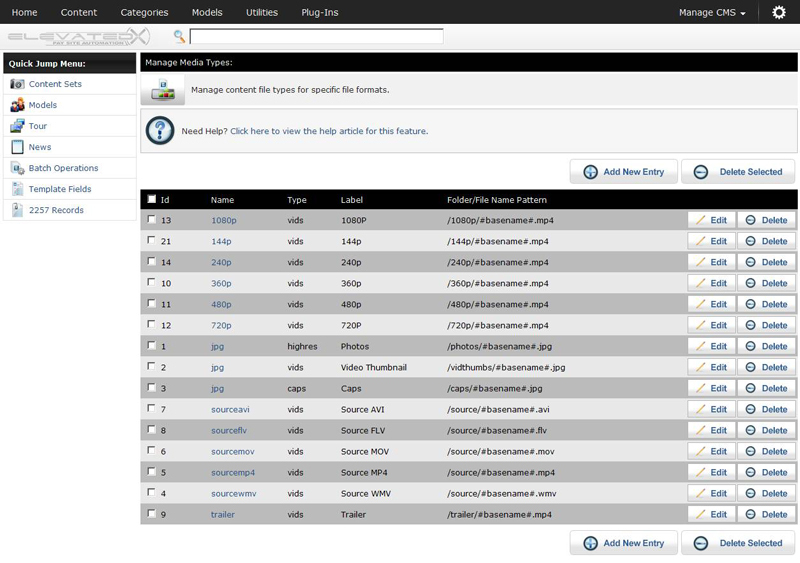 Media types are file patterns in the CMS that control what types of content gets read into the system when you add a set of content. 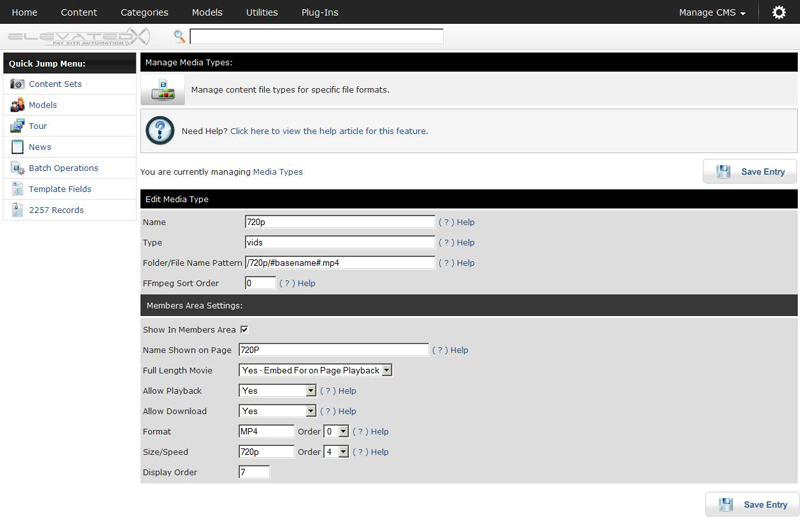 They also control how that content displays in the various areas of your site. Each of the above media types determine the names and spelling of subfolder to organize your content so the system can read your files. “720p” - This media type tells the system to look inside each set folder for a subfolder named “720p”. If it finds a folder that it can read(CHMOD 777), it will look inside the folder for a *.mp4 file. If it finds the file it will index this file for this set, as a piece of content that will be available to your members. The settings determine how to handle this piece of content. “Yes - Embed for on page Playback“ - This will add this file to the page to be embedded and play on the web page. “Yes - Show Download Link” - This will show a link to this file for download. “No” - This file will not show on the page. “Not a video file” - This media type is not a video file. Allow Playback - Yes|No : This setting applies to both video clips and full length movie files. If "Yes" the media will show in the "play" table, if "No" it will not. Allow Download - Yes|No : This setting applies to both video clips and full length movie files. If "Yes" the media will show in the "Download" table, if "No" it will not. Format Order: Format is the text that will show in the movie watch/download list on the site. This is typically the format of the movie e.g. MP4 Order specifies the listing order of this format in the list. entering 1 for MP4 and 2 for another format will result in MP4 being listed at the top. Size/Speed: Size/Speed is the text that will show in the movie watch/download list on the site. This is typically the quality or size of the movie e.g. HD, High, Low, 1280, etc. Order specifies the listing order of this format in the list. entering 1 for MP4 and 2 for another format will result in MP4 being listed at the top.